The poems in DECEMBERS have been written, usually one a year, beginning in 1973 when the author moved from the South to New Wilmington, Pennsylvania, where he took a job teaching creative writing at Westminster College. They are written to accompany the Christmas cards he and his wife Jane write each year to keep in touch with friends from college, graduate school, and earlier jobs. These poems arise out of memory, both of the author and those of others. In them Perkins is much more interested in the images of the season, the sights, the sounds, the scents, the textures, and the tastes than he is in the abstractions: joy, love, warmth, gratitude, etc. He is more interested in what the season is than in what it means. 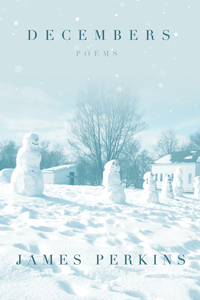 A short story that closes the book tells of how one day Perkins saw one of his December poems on Nancy Lewis’s refrigerator in Bethany, Connecticut, and wondered how many other refrigerators were so decorated. The story came out of that wondering. We all have memories of the Christmas season; they are all deeply personal and unique, and yet, curiously they are all pretty much alike. Readers will find fragments of their pasts as they read these poems.